Each month, your Neighboring Food Co-ops feature our region's artisan cheesemakers by offering a specially selected cheese at great price. 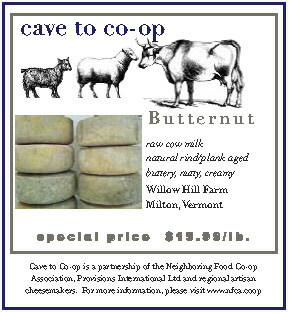 Look for the "Cave to Co-op" sign in the cheese section at your local food co-op. To find one near you, visit www.nfca.coop/members. Willow Smart's unlikely path to cheese began in Hawaii where she spent her childhood on one of the largest cattle ranches in America. When she left to study psychology and foreign language on the mainland, she hardly imagined a future in a barn. But then she met her husband-to-be, David Phinney, and he brought her to Vermont. In 1991 Willow and David acquired a 400 acre Vermont farm and a herd of sheep. They built the cheese cave pictured below with stones they pulled out of the earth as they cleared the land. By 2005, four of her sheep cheeses had won awards at the International Cheese Awards in London and at the American Cheese Society's annual competition. They have now diversified the farm to include cows and cow milk cheese, but continue to be dedicated to using old world methods in making their cheeses and believe it directly affects flavor. All of their animals graze on the indigenous grasses and herbs of their hillside pastures, which in turn create unique flavor profiles in the cheese. Each batch of cheese is handmade and then matured in underground caves that are ventilated by the surrounding woodland. Plank aging in the small caves provide the optimal humidity and temperature control for the cheeses. Constructed out of concrete eight feet underground, with a back wall of Vermont's natural bedrock, the tiny fissures in the rock seep water into the rooms dependent upon the seasons above ground. This makes for small nuances in each cheese throughout the seasons. Willow Hill’s cave is the only one of its kind in the USA; somewhat like a mini-Roquefort cave with its back wall providing natural molds and droplets of water that are indigenous to the farm. Willow Hill Farm cheese is unique in that each one is created from an original farmhouse recipes and ripened in these small underground caves, so that each wheel carries with it flavors indicative of the native flora and fauna. "When you eat things made close to you, they always taste better," says Willow. Butternut is an Alpine style raw cow milk cheese that is aged for three months on wooden planks. It has a distinct and buttery flavor with hints of hazelnut and grass. Some say it reminds them of buttered popcorn. Lovely on its own, here are a few simple recipes using Butternut that do their best to beat the cold chill of January. Arrange the 4 puff pastry squares 1 inch apart on a baking sheet lined with parchment paper. In a frying pan, cook the bacon in 1 T of olive oil, until crispy. Remove, and drain on a kitchen towel. Add the leeks and a pinch of salt to the pan and cook over a medium-low heat until soft and glistening. Towards the end of cooking, add the garlic and finely chopped rosemary. Remove the cooked leek mixture from the pan and set aside. Now add the other T of olive oil, along with a pinch of salt and a good grinding of pepper, and cook the mushrooms over a medium heat until soft, stirring regularly. If the mushrooms have produced lots of liquid, strain out with a sieve. Beat the egg in a small bowl and brush the pastry with the beaten egg. Using a fork, prick the center of the puff pastry, making sure to leave a 1-½ inch band around the edge of the pastry. This will ensure that the pastry won't rise in the center, while the unpricked outside will rise to form a crust. Mix the bacon, leeks and mushrooms together. Spoon some of this mixture onto the center of each pastry square. Top with the diced beet and the grated Butternut. Bake the tarts in the oven for 15-20 minutes, or until the cheese is melted and the pastry edges turn golden brown. Serve warm. Using a sharp knife, make crosswise cuts in each potato, about 1/8 inch apart, stopping about ¼ inch from the bottom. Add butter slices to between the cuts; season with salt and pepper, to taste. Transfer potatoes to a baking sheet. Place into oven and bake until the outsides are browned and crisp, about 1 hour. Heat a large skillet over medium high heat. Add bacon and cook until brown and crispy, about 6-8 minutes. Transfer to a paper towel-lined plate. Top potatoes with cheese and bake until melted, an additional 5 minutes. Serve potatoes immediately, topped with sour cream, bacon and chives. Melt the butter in a medium non-stick skillet over low heat. Add the onion and cook, stirring, until soft, about 5 minutes. Add the egg mixture and cook, stirring, until loosely set, about 3 minutes. Sprinkle the cheese over the eggs and stir to combine. Continue to cook, stirring, for 2 to 4 minutes depending on desired firmness of the eggs. Top with parsley and serve immediately.